Presentation Authorization for "THE GEOGRAPHY GAMESHOW"
Neal Nichols, Jr., creator of "The Geography Gameshow" will appear and host a variety of selected programs in accordance to guidelines set forth by the show. The presentations will be offered with consideration of school policies, conducts, and ethics that pertain to students, teachers and staff members. The format of the events includes, and is not limited to an introduction speech, rendering of map(s) from memory, lesson plan outline and adaptations to the program, student participation and interaction, story narrative(s), and conclusion. While performances may vary according to audience size and grade level, adjustments may be made to accommodate specific requirements or circumstances. A limited number of students will be selected from the audience to participate in the show. Unless otherwise requested, active students may receive a prize token for successfully achieving certain tasks or answering questions correctly. (Programs are also available without the inclusion of prize tokens to meet particular school criteria) Upon request, prizes will be available for school inspection and approval before the show. Once awarded, all prizes are final and become the property of the recipient. Please note that Neal Nichols, Jr., "The Geography Gameshow" and it's affiliates are not responsible for any emotional or physical distress that may occur with students attending the event due to show results. This includes, and is not limited to students without the opportunity to participate, incorrectly answering a question or successfully completing a task, failing to receive a prize token, or being asked to leave the show due to inappropriate behavior. The school staff and teachers are expected to assist in maintaining proper student conduct at the show. 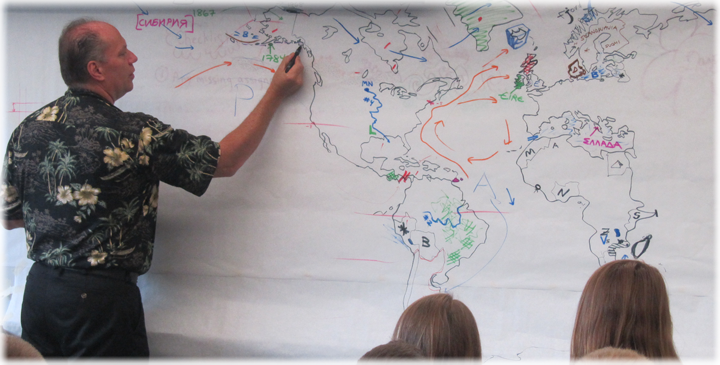 Decisions and results made by Neal Nichols, Jr. and "The Geography Gameshow" are considered final. Photography is allowed in all shows. When used in the media, public newsletters, internet, etc. Please send a hardcopy or link to the contact address. Videotaping in part may also occur when notification and verbal approval is authorized by the host. A copy of the raw footage on disc must be provided and notification of it's purpose and intent explained. Any videotaping of the shows may not be replicated and solicited as educational material or used commercially without written consent from Neal Nichols, Jr., as all content and material herein is deemed copyright. Pricing Guidelines for "THE GEOGRAPHY GAMESHOW"
Please contact Neal Nichols, Jr. for pricing guidelines and information to schedule "The Geography Gameshow" at your school. Pricing discounts are made available based on location and the number of dates booked. Also note that schools scheduling annually may receive a discount, as well as schools that book multiple dates by region. Same schools within the same district will also be eligible for a discount.